Hello everyone. We have a new release with over eighty new and improved nodes! And we have the results of your thoughts on Vuo's pricing. View the release notes for all the specifics. 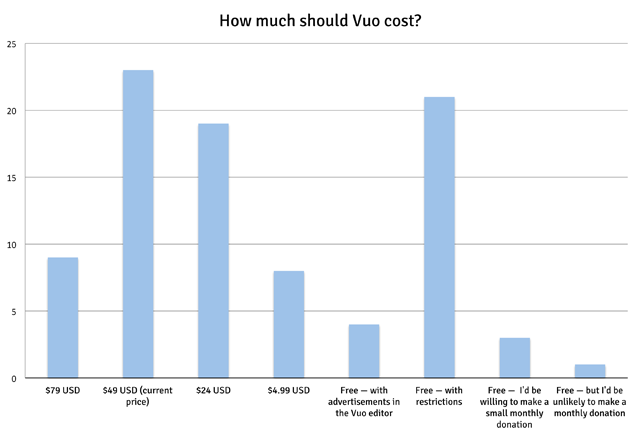 Many of you have weighed in on what Vuo should cost in order to grow the community. We received 98 responses, 10 where the response was "other," further explained in comments. As you can see, 23 people thought Vuo's price should stay at $49, 19 thought it should be $24, and 21 thought Vuo should be free with restrictions. "Although I live in a country that makes US $49 a lot of money for most of us I think your present business model is quite effective." "Thanks to the fact that there is a free trial, the $49 never prevented me to use Vuo, I think it's a fair price." "You mention the main goal is to grow the community. There is no better way than to make your software free and have MORE people using Vuo. That way there will be many more pro's who will switch to Vuo and can afford the pro license." "Free trial with strong restrictions e.g. resolution, special nodes, watermark will get more people interested but may also come with a higher support burden." "I really want to see Vuo succeed, but I worry that it doesn't open enough doors for new users until they fork over some money. I think killing the price for the non-Pro version and removing functionality would be the wrong move…"
"I'm sure there are many people out there that could benefit from Vuo that are unaware of it." We consider every comment we receive, and your comments will help us figure out any pricing changes in the future. In the meantime, we're adding new functionality for Vuo 1.3, and we're working on some design changes along the lines of what some of you have suggested in discussions. Thanks for your input, we value it greatly. Please use our contact form if you have more to share with us. How much should Vuo cost?